Welcome to the Socros 8 Page! A sneaky preview of the Socros 8 Domain logon screen. 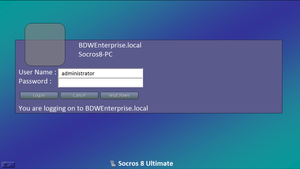 How do I try Socros 8 Ultimate? Just download the web launcher below! Note: When you are at the logon screen, just press logon as there is no password. Use this ISO to burn your own Socros 8 Ultimate install disc for free.